Uzala has announced a new tour set to begin November 1st. They are still supporting Tales of Blood & Fire, which came out last year. If you haven’t heard this band yet, check out the full album via Bandcamp below. I had the opportunity to see them at the Autumn Screams Doom festival in Baltimore last year, and the hazier doom riffs combined with Darcy Nutt’s powerful vocals made them one of the highlights. Check out the full list of dates below, and if they’re coming your way don’t miss out! 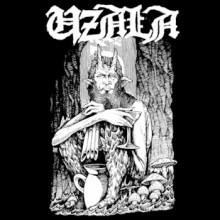 Following the release of last year’s critically-acclaimed LP Tales of Blood & Fire and a triumphant appearance at this year’s Gilead Fest, Boise fuzz-doom peddlers UZALA will once again take their spellbinding show on the road, joined by a few very special guests. For the first leg of their upcoming November tour, the Northwestern trio will be joined by Oakland doom raiders CARDINAL WYRM before meeting up with PINKISH BLACK at No Thanks Fest and forging ahead towards home. Nov. 8 Emory, TX NO THANKS FEST with In the Company of Serpents, Sabbath Assembly, Pinkish Black, and many more!!! Stay tuned for more bewitching UZALA news in the new year!